The DCI Summer Tour raced through Louisville on July 7and brought with it eight drum corps from the World and Open Classes. Fans at Papa John's Cardinal Stadium gave their appreciation to all the participants, from the gold medalist Cavaliers, to the Open Class contender Revolution. View a photo gallery from the event. 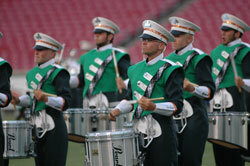 Find an upcoming DCI Summer Tour event near you. Photos by David Rhodenbaugh.